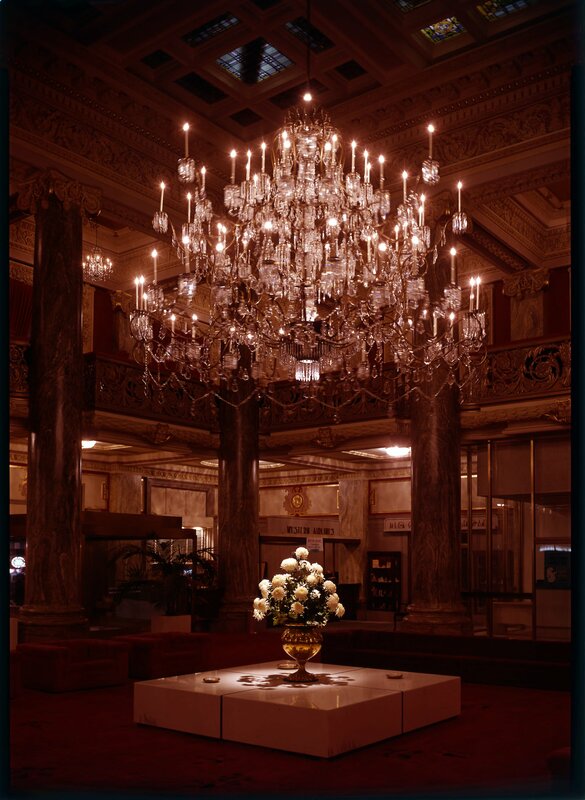 Description Photo shows the interior of the Hotel Utah main lobby with its chandelier. Caption on photo: "Lobby - 1956; Decor - Clark - Reaming Co."
Additional Information "Work on the Second Renaissance Revival style hotel, designed by the Los Angeles architectural firm of Parkinson and Bergstrom, began in June 1909. Two years later, on June 9, 1911, Hotel Utah opened for business. While the L.D.S. Church was the primary stockholder, many Mormon and non-Mormon community and business leaders also purchased stock in the effort to provide the city with a first-class hotel. The ten-story building has a concrete and steel structure and is covered with white glazed terra cotta and brick. Various additions and remodelings have occurred throughout the years including a substantial expansion to the north and modifications to the roof-top dining facilities. The building ceased operations as a hotel in August 1987. A major remodeling and adaptive reuse project to accommodate both community and church functions was completed in 1993. "-Text from historical marker outside the hotel. It was operated from 1984 to 1987 by Westin Hotels, and renamed the Joseph Smith Memorial Building in 1993.